I bet the Kaiser insisted on better weather than this for his visits to his beach resort. The basket chairs on the beach would be pretty soggy for his imperial derrière by the end of today. It was sunny all morning in fact and we did get some jobs done. "Poor me" laboriously typing my blog into the phone with one finger, and Howard working on the wind vane self steering. 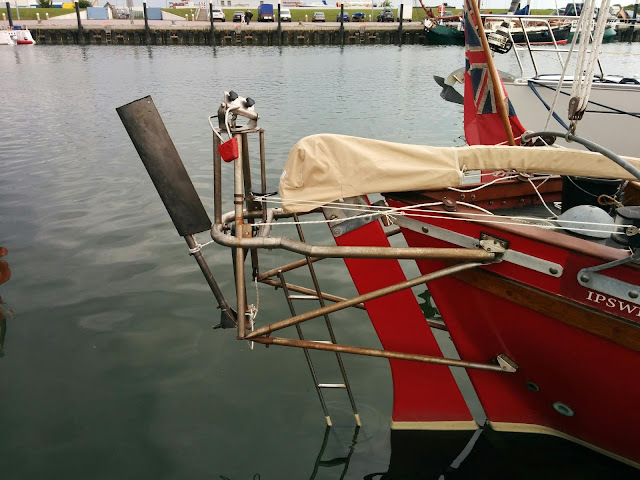 Followers of this blog since the beginning will know that considerable work has already gone into bringing this very useful bit of kit (which should steer the boat when we're sailing) back into commission. It was incinerated in our workshop fire in 2009 but has slowly but surely been reconditioned and reassembled like a phoenix from the ashes. A highlight of this process, if you haven't been following, was the casting of the lead counterbalance - blogged back in May (post on 1st May called Alchemy if you are interested and can be bothered to look it up). Back in the canals, at Dokkum I think, Howard had created a sort of 'plug' of Sikaflex at first one end and then the other of the paddle of this device (which he'd filled with expanding foam back at home). So now in Nordeney he fixed it in position and sorted out an experimental first rigging of the system ready to test out tomorrow. Then the rain started. We guessed at 2 and a half to 3 inches in our bucket on deck later, but for now we took refuge below. 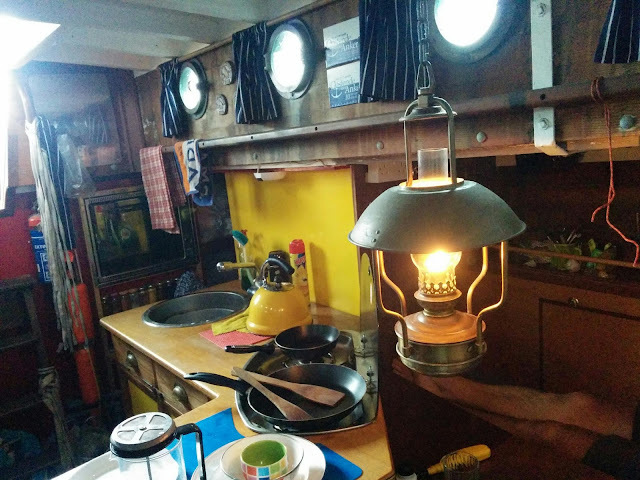 The oil lamp lent a bit of cosiness as we could barely hear the radio playing above the drumming of rain on the deck.